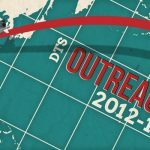 Home » DTS Outreach Blog: On to Napajat! Wow, its good to be back in Thailand! This past week has seen us settle back in to what should be a bit more familiar, and enjoy both the food, and the Thai language we have spent many hours trying to learn :). We arrived January 6th in Chiang Mai (northern Thailand) by overnight train from Bangkok. The cool weather and mild climate was a nice change from the hot and humid climate of Bangkok. The easily accessible amenities of Chiang Mai were a real bonus too. Our time in Chiang Mai lasted only a few short days, seeing some time for preparations for our village stay and also a little time off to recover from sickness, and simply relax in the beautiful city. Sadly sickness has been a close friend to many of us throughout our trip, but it seems as though being in Thailand is the bit of change we all needed. Many of us are recovering and feeling much better since our arrival here over a week ago! Now after our short stay in Chiang Mai, we find ourselves in a quiet and peaceful Shan village in the north of Thailand, called Napajat. Napajat is located 20 minutes north of Maehongson (the largest town in our vicinity). I feel the need to comment on the trip from Chiang Mai to Napajat, as it is always quite memorable. In saying that, I personally have made this trip maybe five or more times, yet it never seems to get old, or any better. The total travel distance is only 320 kilometers (approximately), but those 320 kilometers are jam packed full of over 1800 hairpin curves! In saying that, it doesn’t take excessively long to make this journey, as the mini-bus drivers make short work of the many turns and push the limits of what some would think to be safe, and at times what I would think to be safe! In saying that, we all made it here safely, and no lunch was lost to car sickness:). We have the privilege of staying with a local church leader, Pii T in the village of Napajat. Hospitality is a huge part of Asian culture and Pii T has treated us very kindly. She has personally sought to fatten us up during our stay in Napajat with the many delicious Shan dishes she feeds us. I love Napajat for the continuous laughter and good times that seem to be happening. Wherever you go there seems to be something to smile about or laugh about. Pii T is also teaching us some Shan language — funny enough though, most of it relates to eating or food. I think this probably says a little something about Shan culture :). 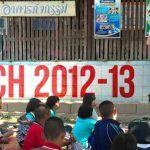 Our schedule here in Napajat mainly consists of teaching English at the local school, both mornings and afternoons, to grades kindergarten through six. The school also has a fun atmosphere about it. All of us are enjoying the children, and the opportunity to teach that we have been given. We are all gaining a new appreciation for teachers, as we have found out just how much work goes into preparing lectures and class assignments! How did our teachers do it? Our evenings are comprised of either prepping for our next day’s classes, relaxing, or visiting people around the village. Jordan and I have thoroughly enjoyed the soccer and ping pong the youth play in the evenings. It gives us a good chance to have a bit of fun with the people in the village. We are really enjoying our time here in Thailand, and the joy and love of the people of Napajat! We have another two weeks here, and I hope this time yields many friendships, and service to the community here. We have also had the privilege to join some bible studies and Sunday church, with the church here in Napajat. I can say for myself that it is very encouraging to see the church here and how they walk out their faith! Prayer is a part of everything, and it challenges me to have the same attitude and habit. In saying all that, the journey continues here in Thailand. We thank God for our time here and the opportunities he has given us in Napajat! I just happened upon this blog while googling napajat thailand. My daughter is a missionary with OMF and has been moved to Napajat ro continue her work among the Shan’ I never dreamed other Americans had been there let alone anyone with ties to DTS.